What makes an agate special? Agate is a type of chalcedony, a milky form of quartz, that appears in a striking banded formation which people have found aesthetically pleasing for centuries. Chemically, it is identical to quartz, amethyst, and carnelians, but because it forms in a different way, agate looks radically different. Like all forms of chalcedony, the chemical formula for an agate is SiO2, and the colors come from impurities in the silicon dioxide, however, Agate is a very complex rock. Pockets in rocks fill with water and gas, crystallize and over time you have an agate, simply put. Agate is a very complex rock. 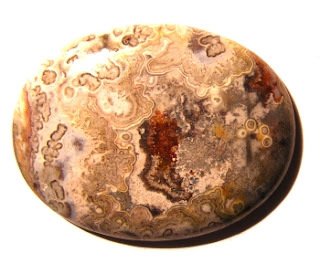 The Montana Moss Agate is known for the dendrite, pictures of trees or moss, and ribbon effect; sometimes called Sergeant stripes in a rock. 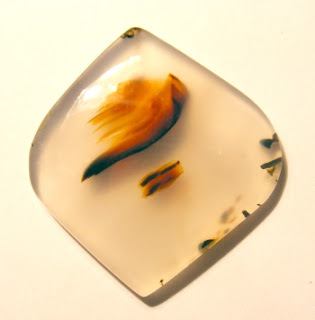 The name given to the beautiful chalcedony found most abundantly in the alluvial gravels of the Yellowstone River probably should be named the Yellowstone Agate; the genesis was centered in the Yellowstone Park area. Montana Moss Agate is a semi-precious stone and in 1969, Montana Legislature passed legislation making the agate the state's official gemstone along with the Montana sapphire. Montana Moss Agate can be found in many colors from dark (almost black) to brown to orange or green to clear. Montana Agate values have soared with its increasing scarcity.